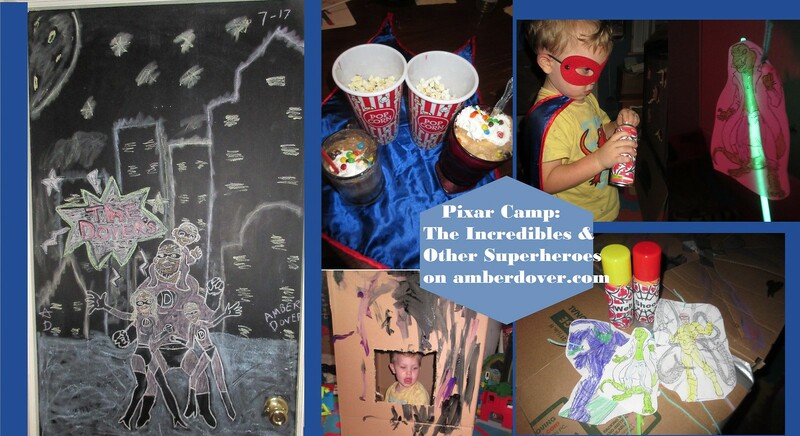 In this post: My 8th Pixar Camp post! Superhero fun with the Incredibles. Also, a Spiderman web shooting mission in a cardboard city full of glowing villains! Hello, Dear Ones! There’s something about superheroes and little boys. My guys (big and small) love superheroes. Leeland knows the name of the Avengers, Batman, and Spiderman…though he’s never watched their movies (except the Batman Lego Movie). So the kiddos really enjoyed this week of camp. Here’s how it went down. We started with watching The Incredibles. Batman and Captain America Fun- Batman plates and a Captain America rag…Dollar Store goodies. A Super Book- Here’s Michael reading “Just Like You” to Leeland. I’m not sure what that look was for. Ha! Anywho, it is a very sweet book about two brothers that go on adventures together. Superhero Play- Leeland is playing with a Hulk peg doll in Batman’s hideout. Michael is making his own comic book. Boxing- My boys like to play rough. The best way to tone that down is to bring out toys that fight for them…like these Rock’em Sock’em Robots. You can see the boys became Superman and Antman. Batman vs Superman- More superhero play ensued. Avengers Movie Night with My Big Kid- Michael is old enough to enjoy Marvel movies with me. We also went to see the new Spiderman movie together. Superhero Coke Floats were the perfect treat! Putt Putt Golf- This was a great activity for Superhero week. Why? Well, our Putt Putt place has a corner with mini skyscrapers. All the superhero movies take place in big cities it seems. The Making of Our Own City- We were inspired to make our own mini city with cardboard boxes from Home Depot. You can buy big boxes for a good price. I printed out Spiderman’s top three villains and attached glow sticks to them. Then I hung them inside the “city” It was dark and wonderful with the glow sticks. Sadly, the flash on my camera ruins the effect. It’s hard to see without flash, but you get the idea. The boys shot the bad guys with their web shooters. Leeland used a leftover noisemaker from Michael’s Spiderman birthday. It worked just as good at hitting the bad guys. Superhero Music Videos. These were their favorites.